Ender previously offered to share his knowledge when ResidualVM caught up, saying this was all very easy to do, so while I'll bug him, is there anyone else with knowledge to share? UPDATE: We've moved to our own subforum thanks to the generosity of the ResidualVM team! Last edited by JohnnyWalker2001 on Sun Nov 17, 2013 12:19 pm, edited 3 times in total. Ok, so everything I will be messing with lives inside DATAxxx.LAB files. It seems that both the .3do files and .mat files have been altered in some way. I've tried viewing the textures in MatMaster, but it maps the palette incorrectly -- so you can see the shapes, but the colours are all wrong. Does anyone know of a good tool for dealing with .mat files? Edit: It seems that .mat files usually come with a palette file. 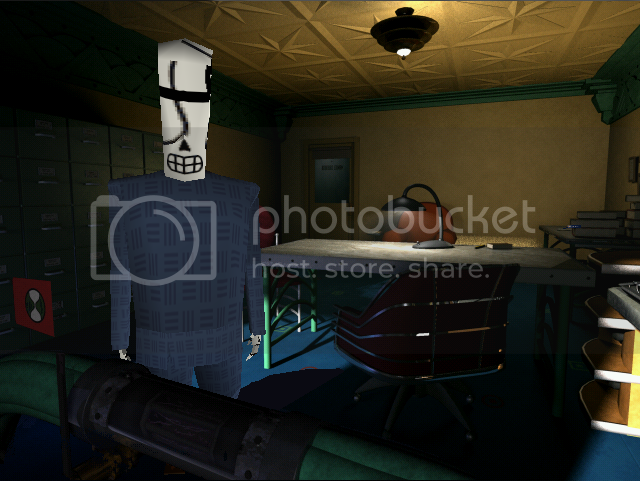 Does anyone know where I can find Grim Fandango's palette file? .mat files contain textures, sometimes several. To extract the BMPs use a tool like MatMaster 2.0, but you need to connect it with the right colormap (.cmp files) to get the right colours. I found Manny's head and suit (m_eye.mat and m_s_chest.mat from within DATA000.LAB -- connected with suit.cmp). I opened the BMPs up, converted them from 128x128 to 256x256 and drew all over them and re-saved them (in OS/2 format). I then recompiled a .mat file and then recompiled the .lab using BGBennyBoy's ResourceCompilerCreator tool. The textures don't scale down and add detail, they just display really big. Is there something ResidualVM can do about this? Just guessing: the materials have the width and height of the textures stored. Did you fiddle with them? the width and height for materials are read in binary, not text by the engine, other than that, I don't know where they are defined. Look at material.cpp. Maybe the tool you're using doesn't show them but they have a width and height field. There shouldn't be anything about that in the .3do, yes. Nice. You're absolutely right. Does anyone know where the width and height are being read from? 3. Use the existing model meshes as control points for rendering higher-poly version using an interpolating subdivision surface scheme. The current meshes have VERY few polygons. Just take a look at Glottis. You can see that in material.cpp. The width is usually at offset 76+num_images*40, the height at 80+num_images*40. The value of num_images is instead at offset 12. But .mat files are quite a mistery to me. They have a lot of data which ResidualVM doesn't use and i don't know if that's just garbage or if it means something. Thanks. I haven't got much time to think about GF anymore, but I'll try to keep up for a bit. Thanks for keeping the torch burning. Yep, that's definitely a possibility. Getting the model meshes into something like Maya where I could comfortably mess around with them is a whole other issue, unfortunately. Could you share any insights that might help any part of this process? As for remodelling/increasing the polygon count, Ender had the following to say last time I asked him: "It's a very simple matter to add in a slab of code [to ResidualVM] to load whatever format you want. I'd suggest Cal3D, for which there are 3DS Max, Maya and Blender exporters at least." Does this make sense to you clever programmer types? Sure, or OBJ for that matter, as long as it's a documented format, it shouldn't be that hard to add, the main issue would be detecting that the files are non-standard I guess. Yes, in the .mat files.